I have a lot of eggplant, tomatoes, onions, garlic, and basil from the garden. I decide to make this relish again, the original post was from five years ago. This recipe from the Wednesday July 28, 2010 Chicago Tribune, Good Eating section. Originally, it comes from the Williams-Sonoma “The Art of Preserving” by Rick Fields and Rebecca Courchesne with Lisa Atwood. 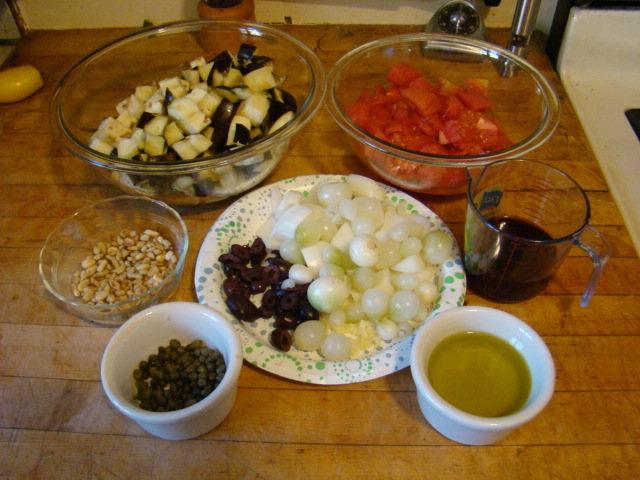 It is an updated version of caponata, a Sicilian antipasto. Though it does take some time, none of the steps are difficult. My only complaint is I am always canning in the heat of summer. Today was 95 degrees! If you choose not to can this you can freeze it, the flavor will be awesome, but the texture will be a little softer. 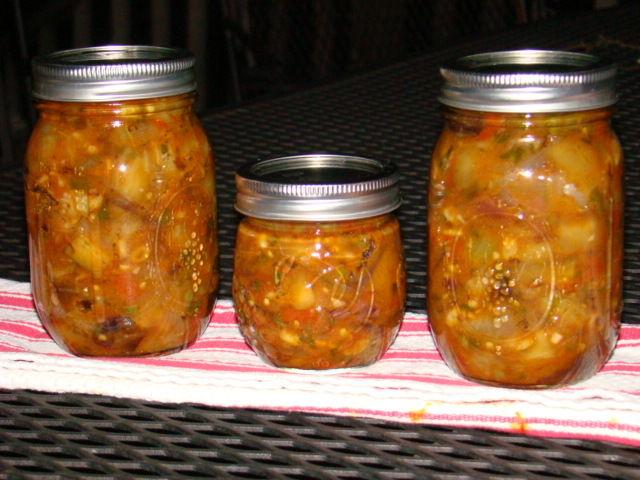 This relish is tangy, and complex tasting. The first time I made this I got 2.5 pints. This time it easily made 4 pints. I’m not sure what the difference is, especially given the time between. I will say it is damn delicious. Serve with crusty bread or stirred into linguine or spaghetti. 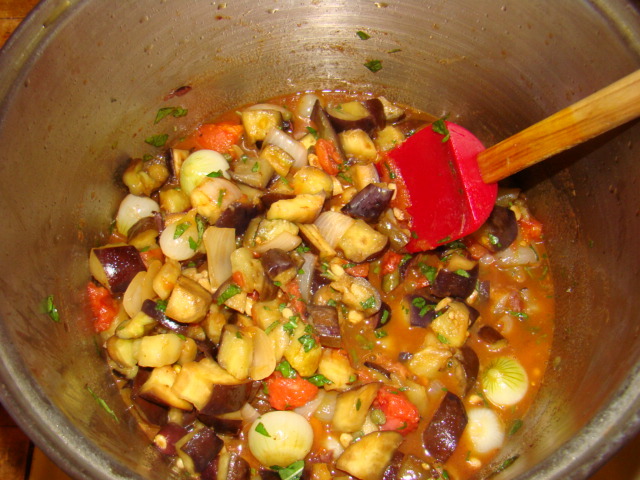 Put eggplant in a colander, sprinkle with the salt, allow to drain for 1 hour. Rinse under cold water, pat dry, and cut into 3/4 inch dice. 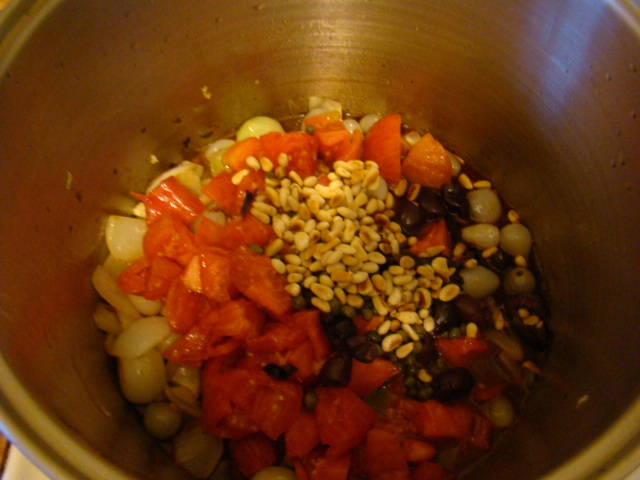 Add remaining 1 tablespoon oil to pot, reduce heat to medium low, add onion and cook until tender – about 10 minutes. Process jar in boiling water canner 20 minutes for 1/2 pints, 25 minutes for pints. Cool jars, test seals, store. If seal fails, refrigerate jar and use within two weeks. I’m saving a bright bit of summer for the dark of winter. Are you putting up anything this year? If so, what is it? Until next time, Eat Well & Keep Digging!.